Menu cases are effective tools for showcasing the unique products and/or services of your organization at a trade show or at your retail outlets. The wall-mountable slim LED menu cases offered by Scribo Displays have aluminum frames with glazed displays. These slim LED menu cases can be locked with their own sets of keys to protect the menu cards displayed on them. 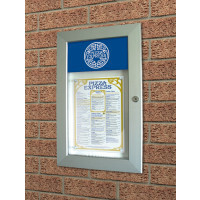 Our wall-mountable slim LED menu cases have low-voltage LED strips inside their top edges. Customers also get 12V adaptors and 3m waterproof extension cables, too, along the slim LED menu cases. Take time out of your busy schedule to locate the slim LED menu cases of your choice for your organisation’s indoor and outdoor displays.